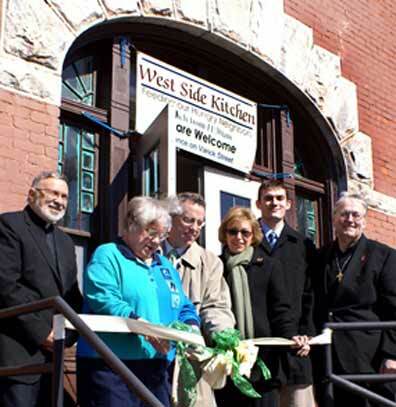 UTICA, Dec. 13, 2009 -- Mother Marianne’s West Side Kitchen has served over 40,000 meals since opening its doors to the homeless, the jobless and the working poor in March 2008, Deacon Gil Nadeau, director, announced in an Annual Report distributed at weekend masses at St. Joseph-St. Patrick Church Dec. 12-13. The soup kitchen, which serves lunch Monday through Saturday, hit the milestone in December. To date, he said, the soup kitchen has been entirely supported by donations from parishioners and the community, plus several grants from the government and private agencies. The soup kitchen is run out of the Parish Center. “With the grant monies, we have been able to upgrade our Parish Center kitchen and add much-needed equipment and fixtures costing $22,000,” he noted. Pointing out that the soup kitchen is an all-volunteer operation, with no payroll expense, he gave a financial report covering March 2008 through November 2009. During that 21-month period, he said, the soup kitchen received $33,852 in donations and $32,990 in grants, and spent $40,998 on food and supplies, and $25,854 on equipment, repairs and other expenses.